So, with the final post on this blog for the time being, I wanted to find something which reflected the quirkiness of Glasgow as I think it’s the quirkiness that I really like about the city and hope I’ve managed to portray here over the last couple of years. This comes from the stairway at the Lighthouse, until last September Glasgow’s Centre for Architecture and Design. Sadly the Lighthouse had to close due to financial troubles, which I’m really sad about as it was one of my favourite museums in the city. I hope a way is found to resurrect it somehow. Thanks to everyone who has been kind enough to leave comments here since I started this blog – although lately it’s been a bit more of an effort, for the most part it has been an absolute delight to showcase this great city. I’ve learnt lots – about photography, about other cities in the world (through the City Daily Photo Blog initiative of which this blog is a part), and about Glasgow. So that’s cool 🙂 Thanks to you all. 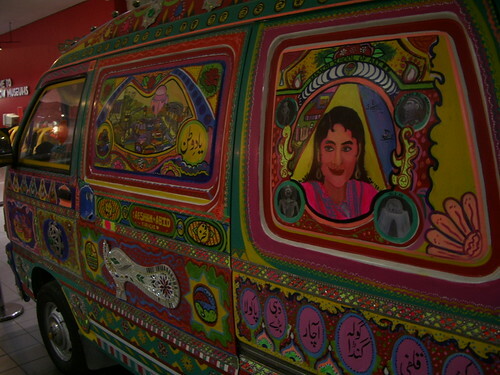 This is one of the more colourful exhibits in the Transport Museum, from Pakistan. Apparently there was a project in Glasgow a few years ago to decorate a bus in a similar style, but I don’t know if anything ever came of it? [Again hoping I’m not recycling a photo!] 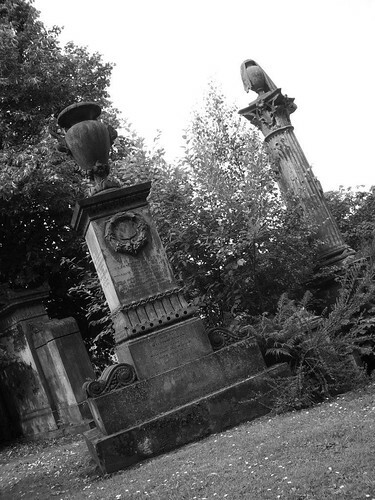 Just a random view from the Necropolis. There’s no competition, you have to take pictures here in black and white. 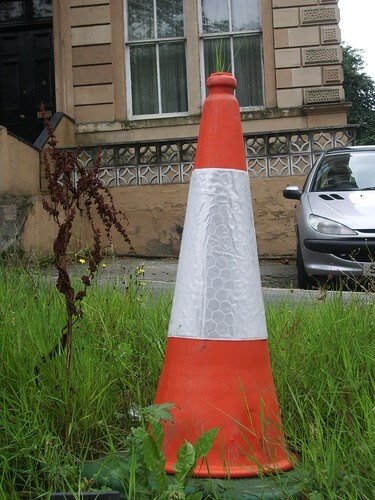 This cone, which I snapped a couple of years ago on Great Western Road, appeared to have been there so long that you can see the grass growing out of the top! [Really hoping I haven’t shown this photo on the blog already!] 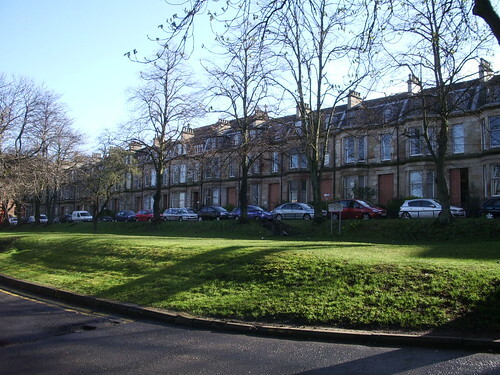 Lilybank Gardens is a row of tenements owned by Glasgow University and housing various departments – including mine (though my office, on the rare occasions now I’m back at uni, is not here but up the hill a bit). Here’s a bit of an entrance way which is worked into the fabric of the modern building of the Burrell Collection. 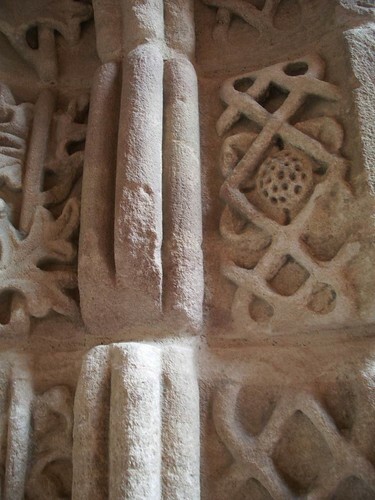 I’ve not been to the Burrell for a while – we ought to go again soon, it’s so near home it’s criminal not to visit more! 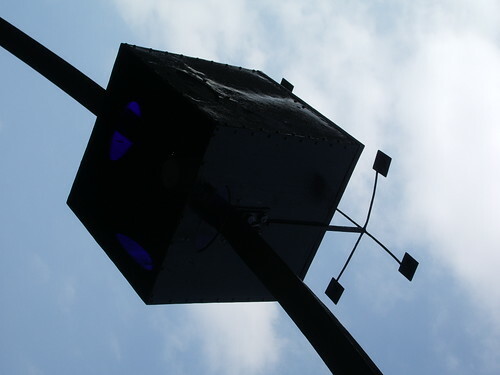 This odd photo is from outside Glasgow School of Art, and if I recall correctly is part of the lighting around the building. 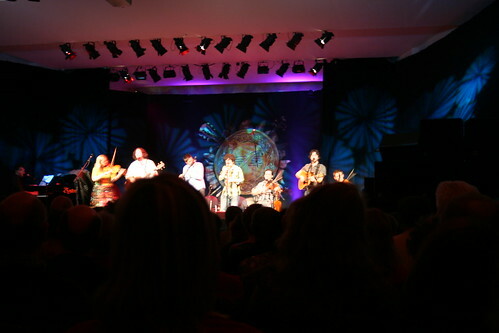 The gig I went to see at the Strathclyde Suite was headlined by Quebecois band Le Vent du Nord (‘The North Wind’) who featured here this time last year as I saw them supporting La Bottine Souriante, also at Celtic Connections. The support act was Scottish band Breabach. Actually though in both halves the two bands came and played together – this was taken towards the end of the show, and although not a great photo (I was too far back, this is the least bad photo!) it was a great gig, we thoroughly enjoyed it. They are touring together around Scotland at the moment and Quebec later this year – catch them if you can! 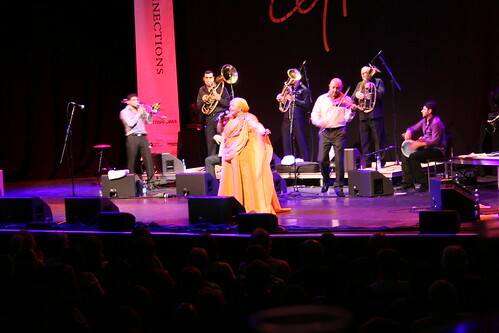 The final Celtic Connections gig I went to was at the Strathclyde Suite, which is upstairs at the Royal Concert Hall. 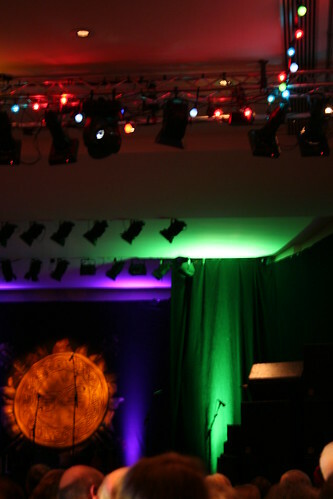 This shows some of the lights before the gig started – I’ll show the band tomorrow. 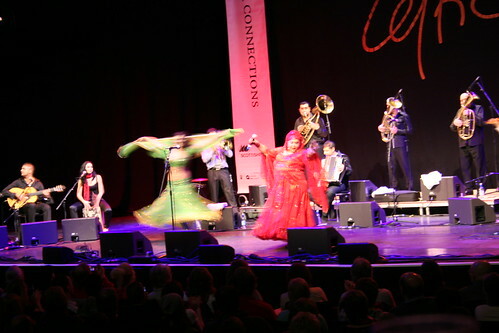 These two photos feature the other singer who performed as part of the Legendary Gypsy Kings and Queens show, Esma Redzepova from Macedonia. She was actually the reason I wanted to see the show (I saw her perform a few years ago when I was in Sibiu* in Romania), and she certainly didn’t disappoint. However I must say that all the other acts were also so good that even if she hadn’t been performing I would have more than got my money’s worth! What a brilliant night.